A surprising new trend is popping up in new homes across America. 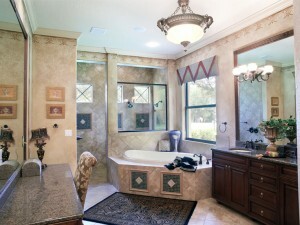 Simply stated, it seems there is almost no limit to the luxuries new homeowners are seeking in their master bath. For today’s home buyers, outstanding master baths are as important as full-featured kitchens and lavish master bedrooms. Well appointed master baths offer a relaxing retreat at the end of the day and their amenities appear at the top of most new home buyer’s wish lists. As elaborate master baths continue to evolve, it is important to take note that large walk-in showers often rival soaking tubs and more often than not, His and Her walk-in closets are contained within the master bath. By 2015, the National Association of Home Builders predicts amenity rich master baths will be consider must-haves in most new homes. Many residential designers are already preparing for the future by including several of these features in the house plans they are presently creating and drawing. Browse The House Plan Shop’s home plan collection to discover some of these innovative designs.